People in Beta is a festival about startup culture, diy and co-working hosted on the 1st of October at betahaus in Berlin. As a part of this festival Nodus Labs will do a workshop on social network analysis starting at 13.30, finishing at 14.30 (reserve your space on people in beta festival website). 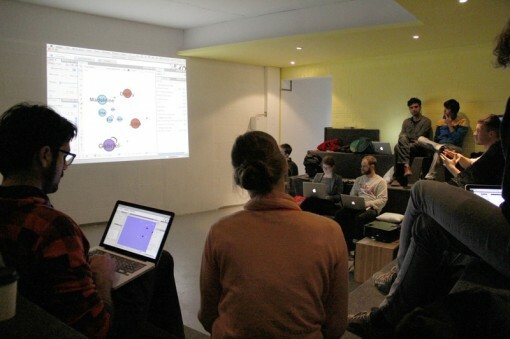 Also, betahaus cafe will be a space where everyone can host their own session, so right after the workshop, at 14.30, we’ll host the second Gephi meetup in Berlin downstairs at one of the open tables. Together with the other guests we’ll talk about the different ways we use Gephi and Dmitry from Nodus Labs will show some practical applications of Gephi for text network analysis and social network analysis. You are welcome to come and join in! You can read a report on the previous meet-up on the blog of Nodus Labs. Dmitry Paranyushkin is a professional amateur who’s had numerous affairs in the fields of arts, music, intersubjective relations, network research and internet business. He’s the founder of ThisIsLike.Com – an online mnenomic network and Nodus Labs – an exploratorium of ideas in the fields of network analysis. Having fled Russia for undefined reasons in 1976 he’s found a temporary refuge in Berlin where he lives in a castle on Spree river and occasionally visits betahaus to steal rocket-fast broadband frequencies.